RAYTOWN, Mo. -- Raytown junior quarterback Joe Campbell hopes to have a big year and turn heads. Campbell's stellar Friday night performance against Blue Springs South was the kind of start he was looking to have this season. He went 26-of-44 for 455 yards and 5 TDs, which included a 92-yard touchdown pass in the opening drive of the game. Campbell also led a come from behind effort in their 41-34 win over the favored Jaguars. "I'm gonna be honest, one thing that I got a lot better at during the offseason was my leadership," Campbell said. "There's a few moments in the game, especially when we got down two touchdowns, we were like, 'Wow, okay this is what it could be.' But, I mean, I just, you know, I kept everybody's heads up. We all kept our heads up. We just knew that, you know, defense was gonna get stops. We were gonna come down and score." Most years, the Bluejays might have folded in a game like that against an opponent that has won multiple state championships in recent years. However, second-year head coach Logan Minnick knew that his star quarterback and team leader had a mental breakthrough which led to his success and inevitably the team's success in that game. "Being a sophomore with a lot of talent, but at times, he was a little squirrelly. And, you know, he was still learning on the fly, using his athleticism a lot more than his brain at times I think," Minnick said. "Now though, he has transitioned into being one of our team leaders. You can tell by just his confidence level and then just his understanding of what we're trying to do not only on the field but being a leader in that classroom." The 6-foot-1, 210-pound quarterback said he's received some interest from college coaches. However, he hasn't received any offers as of yet. One thing's certain. His invite to the U.S. Army All-American combine in January following a solid sophomore season (2,655 passing yards, 28 TD's, 12 INT's) helped to bring exposure to this pro-style quarterback, gaining notoriety for having moxie and poise even in the toughest of situations. Campbell and others around him are confident about the quarterback he's becoming. He's even more confident about his team's potential going forth in 2018. "Coach [Minnick] talks about it all the time about our potential. And I honestly think that, you know, the way we played against Blue Springs South, you know, one of the best teams in Missouri, I mean if we can just play with heart for four quarters, I mean, we can put a ring on our finger this season. There's no doubt in my mind," Campbell said. 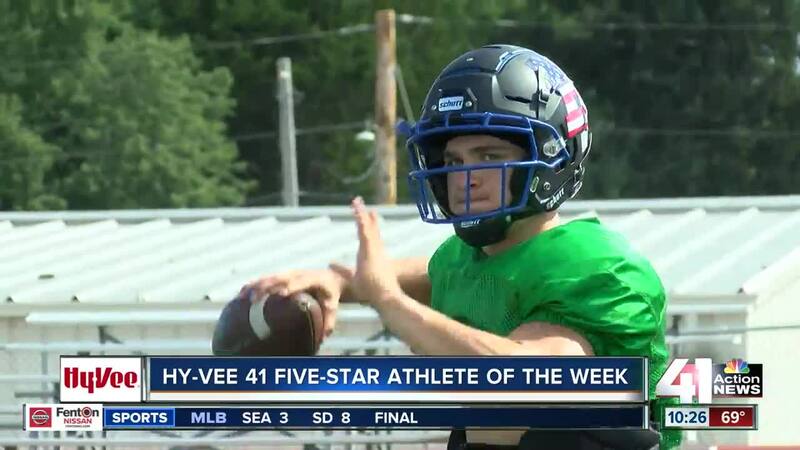 NOTE: The Hy-Vee 41 Five-Star Athlete of the Week segment airs every Wednesday during the 10 p.m. sportscast for the entire school year.